The Mercury Diesel outboard was developed for the US military. New Mercury diesel outboard developed for US armed forces. Diesel outboard is rated to 175 hp. Outboard engine is based on a 3.0lt V6 Mercury OptiMax. Mercury Marine has announced an OptiMax diesel outboard developed exclusively for the US Department of Defence. Following an explosive fire onboard a US Navy boat in 1995, the blokes in charge ordered all petrol storage tanks be removed from naval vessels, while seeking a solution that would see all marine engines running on a single fuel type. Mercury Racing came to the rescue some six years ago with its first version of a 185hp 3.0lt outboard that runs on JP5 jet fuel. But as diesel became the popular choice for military use, a new 3.0lt V6 OptiMax Diesel outboard was born. The all-black OptiMax diesel outboard develops 175hp at the propshaft and shares 95 per cent of its make-up with the petrol version, ensuring minimal additional training is required for defence mechanics. The setup is unusual for a marine diesel engine, in that it’s a spark-ignition engine – the fuel charge is ignited by a spark plug as for a gasoline engine – rather than the compression-ignition engine used on most diesels. A two-stage direct-injection system utilises a burst of compressed air to inject and atomise the fuel charge down to as fine as 10 microns, which when combined with a re-designed combustion chamber, allows spark ignition – rare in diesel engines. The OptiMax Diesel outboard is also equipped with a glow plug, which heats the combustion chamber and helps vaporise the fuel to a combustible state when the engine is cold-started. Mercury Racing has received a number of inquiries from interested civilian punters about purchasing an OptiMax diesel for their own use, but there are no plans to make it available to the public in the near future. 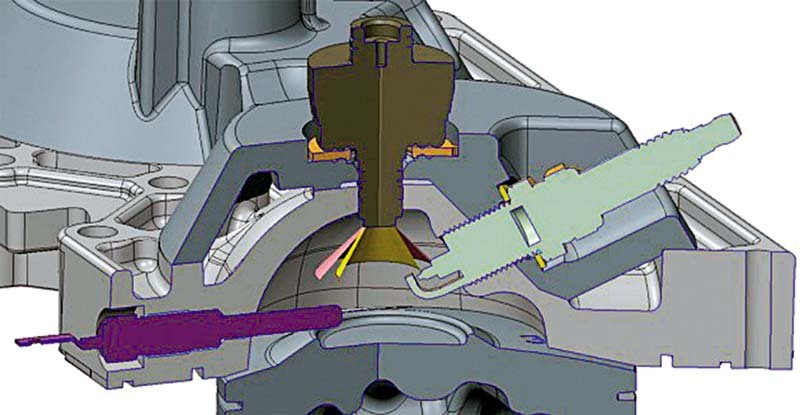 This CAD image of a Mercury Racing Diesel outboard combustion chamber shows the position of the glow plug (purple) and spark plug. The central OptiMax air-assisted direct injection unit creates a cone of fuel vapor (pink) that is wider than the cone created by the injector used in current petrol-powered OptiMax outboard motors.